I’m one day closer to the rankings than I was last week, positive improvements. We are starting to see the effect of the intraconference schedule. As top rated teams start knocking each other off, the playoff picture will become much clearer. Welp, simply put, Auburn lost to TAMU who was unranked at the time. That’s a big no-no in the new voting system and the old. 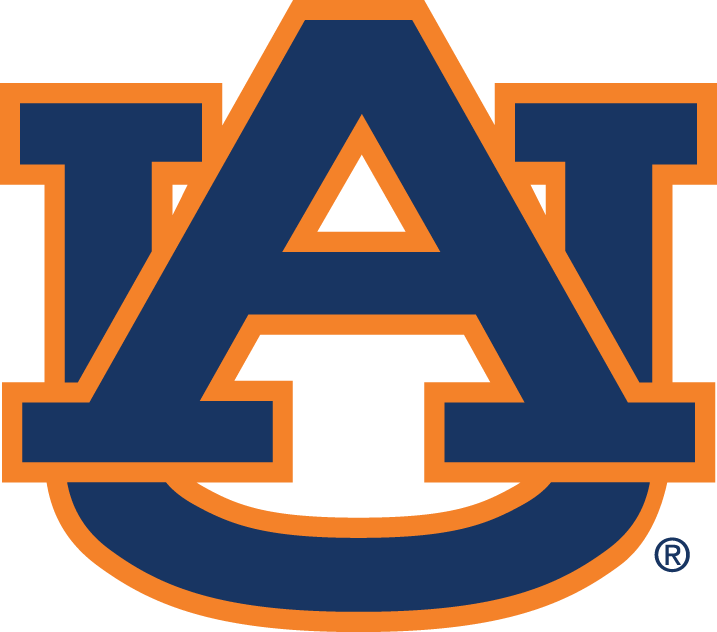 Auburn drops to #9 in the CFP and needs a lot of help to even get back into the Final Four. Consider their playoff aspirations shot. Texas A&M is an interesting case as well. Before this week, they had a pretty lethargic 5-3 record with key wins over only (then) highly ranked South Carolina. They rattled off three straight losses after going 5-0 and promptly fell off the radar. A friend brought up an interesting point though, their three straight losses were to teams who used to occupy the top four spots (Miss St., Ole Miss, Alabama). Beating Auburn should have vaulted them a little further than 24th, but they are weighted down by a lack of quality wins. Maybe Lamar, Rice, SMU, and UL-Monroe just weren’t good enough out-of-conference opponents to squeak into the New Year’s games. Sure, they beat Notre Dame who was #5 at the time. Since that game, Notre Dame was whipped by Arizona State. They are also afflicted by the same problem as TAMU: no quality wins. Florida State has the same problem. They now only own two wins over currently ranked teams (#18 Notre Dame, #19 Clemson). They have not exactly been blowing out their lesser competition, either. I made a prediction at the beginning of the season that Florida State would not make the playoff and I still stand by it. Their remaining schedule entails a road trip to Miami (FL) and a homestand with Boston College and Florida. Miami and Florida are not horrible teams, and they are both rivalry games which brings an extra something to each. Boston College knocked off then-highly ranked USC, so don’t count them out either for upset potential. 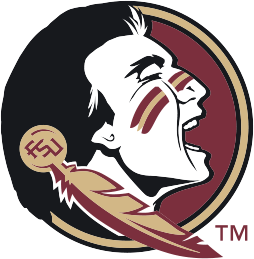 FSU will also have to play the ACC title game which will likely be against #21 Duke. At the very least, TCU, Alabama, Arizona State, Baylor, and even Ohio State have good shots at jumping FSU considering the teams’ remaining schedule in comparison to FSU’s. The second point I’m sure many people who give me the time of day are tired of hearing is that the Pac-12 deserves the same “they beat each other up” cop-out the SEC gets. It’s starting to look like they might be getting closer to that point. Arizona State catapulted up into the top six after punishing Notre Dame at home. They may have already been in this territory earlier if they hadn’t been penalized so harshly for losing to UCLA. UCLA has climbed back into #11 and are sitting nicely to make a New Year’s game. UCLA lost to Utah and Oregon, both dominant teams on defense and offense respectively. After putting together a second four game winning streak including beating #12 Arizona, the committee moved them seven spots up the list. Their recent performance has a lot to do with it, but as does the committee’s perspective on how deep the Pac-12 truly is in regards to ASU, Oregon, and Utah. 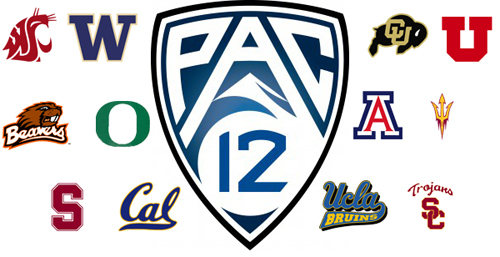 If Oregon and Arizona State win out, and the Pac-12 championship is impressive, the Pac-12 might be the first conference to feature two teams in the College Football Playoffs. The first piece I wrote on the playoff rankings had a bit about Ohio State admonishing them for their loss to Virginia Tech and a weak schedule. I also pointed out Ohio State’s only chance was winning out the rest of the season in impressive form and beating Michigan State. They have continued an impressive run, and beat Michigan State on the road. The committee decided to reward them for that with a leap into the #8 spot over recently shamed Auburn. I maintain, though, they need to continue the impressive wins and leave no questions on the table as they finish out the season. 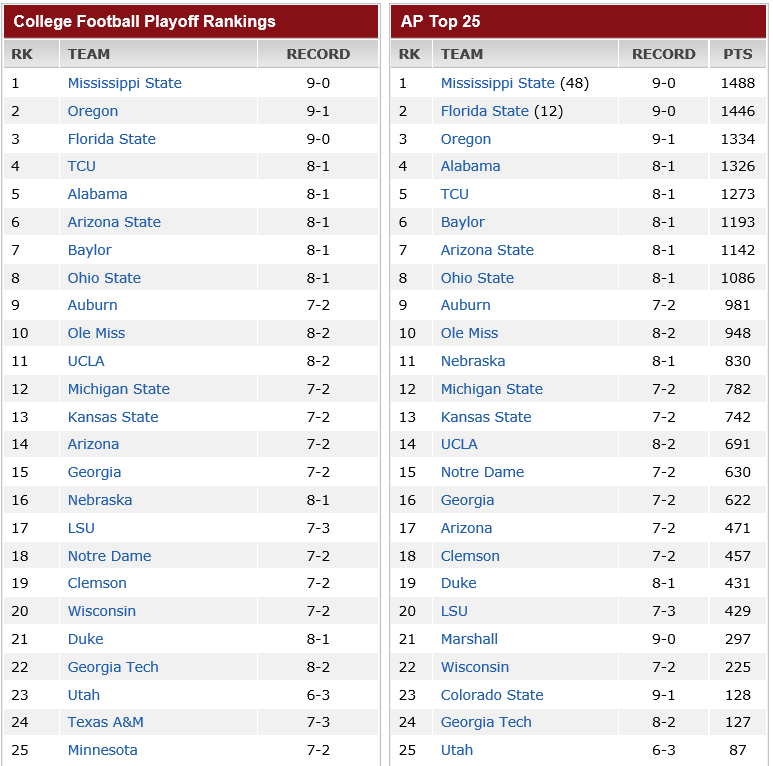 It’s comforting to see how the Committee ranks are “reset” every week and not built upon the previous week’s rankings. Teams like Alabama and Nebraska have been rewarded in the AP Poll despite having not done anything overly impressive, where teams like UCLA and TCU continue to be punished for losses to very impressive teams. The Committee seems to sidestep that hiccup with their framework, and I’m loving it. Previous Previous post: Who the Falk?